MaDCaT is written in C++, with the source code freely available to academic users under the terms of the GNU General Public License. Download the source code from here. Inquiries about commercial licensing should be directed to Dr. Gevorg Grigoryan. where /local/path is a path to the directory where you want the maps to reside. To search against a database of maps, you will need to pass to MaDCaT a file with a list of paths to individual maps. Below are some lists generated for this database, which include the list of all maps (all.list) as well as some smaller non-redundant lists generated by taking the first entry from each sequence cluster produced by blastclust when run on the entire PDB. For example, bc-30.list corresponds to sequence clusters produced at 30% sequence redundancy. NOTE: you will need to replace the string /local/path with the base path to where you store your maps locally. All the executables and scripts that are part of MaDCaT print detailed usage statements when run without command-line arguments. These contain the description of all allowed options. Below we present a simple usage scenario, which should cover the most typical circumstance. Some of the additional non-default options are pointed out along the way, but for a full list of all capabilities see the usage summaries printed by each program. 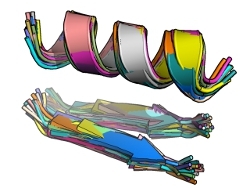 An ideal fragment of tertiary structure (left) and its corresponding distance map (right). Red lines in the distance map delineate locations of breaks between secondary-structure elements in the tertiary motif. This generates a flat-text file motif.map which contains the distance matrix (in the first section of the file, before the END statement) as well as some additional information useful for MaDCaT. If you examine motif.map you will find that 1) values listed are inverse distances and 2) only atom pairs closer than 25 Å are listed (i.e. those with inverse distances below 0.04). Inverse distances below this cutoff value are assumed to be too small and are disregarded. 25 Å is the default cutoff and this can be adjusted using the --dcut option to createDM. Note, however, that the pre-generated database of PDB maps from our server has been constructed using the 25 Å cutoff, so this value should be used when searching against this database. The resulting distance map is visualized in the figure above on the right. This file lists the sequence of each match (in the same order as in the match file) along with RMSD from the query (first column) and distance-matrix difference norm score (second column). Note that the first two matches have the same sequence (and come from the same PDB entry as we learn form the match file above), but have slightly different scores. This is likely because there is some structural redundancy within the entry itself (e.g. it is a non-crystallographically symmetric homo-oligomer). MaDCaT's approach is to disregard such redundancy during the search step and to worry about removing it during the step of analysis (see below). The last category of output are structures. In the syntax above, MaDCaT was asked to place the matching portion of structure from each match into a separate file under the directory named motif.struct (will be created if does not exist). Individual file names of matches are numbered to make the correspondence between match structures and lines in the above output files obvious. If the value of the option --structOutType includes the string "file", instead of one file per match, all matches will be put into a single NMR-style PDB file named according to the --structOut option. Additional options exist that control whether and how information about sequences/structure intervening the disjoint query fragments in the matching structures is presented. See usage statements for more details. 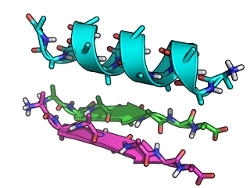 Query tertiary structure (left), matches from bc-30 that align with a CA RMSD below 0.8 Å (middle), sequence logo diagram from close matches (right). Sequence logos corresponding to two sub-clusters from within the close matches to the above query. This asks seqAnal.pl to consider all unique matches to the query with an RMSD below 1.5 Å, then cluster those with a distance cutoff of 0.8 Å (greedy clustering is used), and output various information for the resulting clusters (the sequence logo, if WebLogo is installed, which matches make up the cluster, and their sequences) into file names based on the base name provided in the -o option. 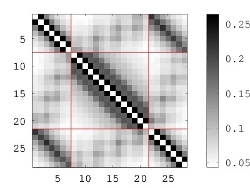 Switches --rbeg and --rlen designate the beginning and length of the region of structure used in clustering. 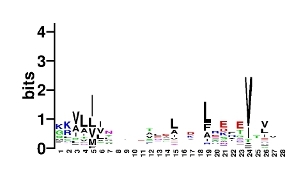 The query structure is in our case 29 residues, so the entire structures is considered in clustering. But sometimes it is convenient to focus on variations only in a certain part of the structure. Many more options are available, please see the usage statement. A web-based applet for MaDCaT allows to search for a structural fragment, specified as a PDB file, with optional breaks in the structure. To limit server load, the web interface is currently limited to searching against a randomly sub-sampled set of non-redundant structures from the PDB (currently 1,000 structures) and returns the top 1,000 hits. Results from such a search can be used to determine whether a given structural motif is common, but will not find every matching instance of it in the PDB. For the latter, use of the stand-alone program is recommended. 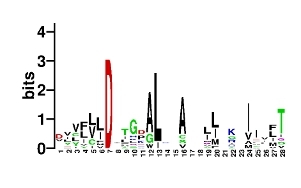 Zhang J., Grigoryan G., "Mining Tertiary Structural Motifs for Assessment of Designability", Methods in Enzymology, 523: 21-40, 2013.